Same script, different players. Welcome, Dwight Howard. When news first broke out that the Lakers landed Dwight Howard, I caught myself furiously typing away at my Facebook and Twitter pages, unable to contain my excitement. Now, 24 hours later, we can officially say it: Dwight Howard is a Laker. Anyway, as I’m writing this, I’m also watching the live streaming of Dwight Howard’s introduction as a Laker. I do feel bad for him, because while this is supposed to be a very happy day (and it is for us Lakers fans) he cannot seem to escape the questions surrounding his very public and downright ugly departure from the Orlando Magic. I keep hearing the words “fresh start”, “today is all about the Lakers”, “I’m just blessed to be here”, “I’m just glad its over with”, “no need to go back to the past”, come out of his mouth, with a tinge of pleading, maybe, to get away from what has happened in Orlando, and just allow him to start anew. Unfortunately, I don’t think basketball fans will be too forgiving. I mean, for one, let’s all admit it. Dwight was able to do what I thought was impossible: He was able to out-villain Lebron and make “The Decision” a little less unpalatable (it didn’t help that Lebron finally won a championship). Okay I admit, that’s taking it too far. “The Decision” will forever stand in its place. Going back to Dwight, the long process of his eventual departure, dubbed the “Dwightmare” all but sucked out the goodwill fans generally had towards him. So I guess it is right, LA offers him a fresh start. But it’s not going to be easy. As a Lakers fan, I can already sense we’re being looked at as Miami Heat 2.0 – the team everybody wants to hate. What’s not to hate, anyway? Dwight Howard, Steve Nash, Kobe Bryant and Pau Gasol all in one team?! Add in Metta World Peace, and we’ve got arguably the strongest starters in the NBA! After all, that’s what’s expected from such blockbuster deals like this, right? 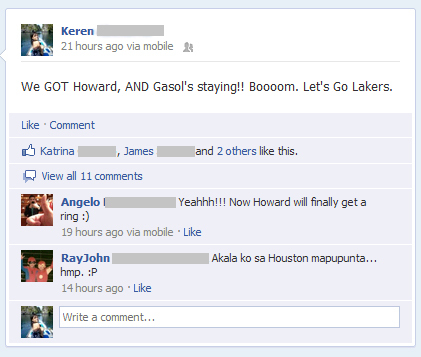 And that’s how Howard will get back to the good graces of basketball fans, right? So Dwight, welcome to the Lakers! I woke up today expecting that the most significant trade news I’d read will be about Dwight Howard, only to find out that, out of the blue, Derek Fisher was traded by the Lakers for Jordan Hill and a future first round draft pick. It came as a shock and as a Lakers fan, I could say I, too, didn’t see that coming. We all know that Gasol and Bynum has been in the trade talks ever since that botched New Orleans-CP3 deal, and for Fisher to be the one traded suddenly, this one really caught me off-guard. Like, wow. I knew that the Lakers were eyeing Ramon Sessions for a long time, because the point guard position is the one that was badly needed to be upgraded. It didn’t occur to me Fisher would be traded as a result (he was deemed “expendable), because I had always thought his locker-room presence, his leadership, his experience, his clout over Kobe, and his importance especially during clutch moments and in the postseason, more than compensated for the “inadequacy” in the position. Simply put, Derek Fisher is the heart and soul of the Lakers. If I had to choose between him and Steve Blake as back-up to Sessions (a much-needed upgrade), I’d still choose Fisher even though this season he has never been as unproductive, because what he brings to the team far outweigh Blake’s. So, for a Lakers fan like me who owed to Fisher the extended joy from winning championships, it is really sad to see him go. What a really cruel, bittersweet world we have in sports. The management will always say such tough decisions are “part of the business”, and I’m sure they are. But for fans who have invested their emotions on select players who were part of the reason why the team had been successful in the first place, we hope somehow, personal considerations override tough business decisions. As this is seen as a salary dump, I wish management just overlooked the $3M something that they would “save” from trading Fisher, and that the Lakers kept Fisher and ensured that he will retire as a Laker, from the standpoint of rewarding his loyalty and his immeasurable contributions to the organization. Having said this, well what can we do anyway? We’re “just fans”. It’s not as if management can undo a trade just because the fans were disappointed with the decision. And the truth is, because we’re basketball fans, we’ll move on, and we will continue to support our teams, because we love the game. Remember when some said the lockout would alienate the fans? Well, we’re still here. Because we love the game. But this is one of those moments when sometimes, the game hurts. I know Derek Fisher will continue to be the consummate professional even in the midst of this stunning decision. I wish him well and I wish he knows that many Lakers fans owe him a big part of our joy. Thank you, for everything, Derek Fisher. You will be missed. There was no doubt in my mind the Lakers will win Game 5. Over the last 3 years leading in playoff games to the Finals, they’ve done pretty well in Game 5s, which in most cases were the pivotal games of the series. 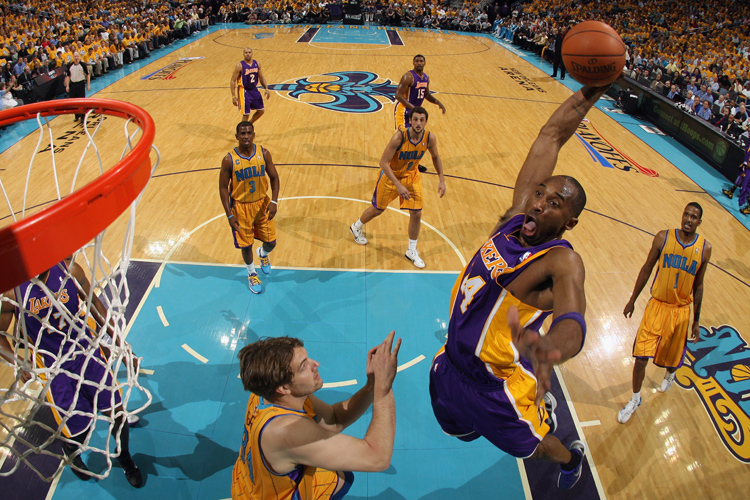 In homage to the Laker’s 16-pt win earlier (106-90) vs the Hornets, here is a treat to delight all Kobe and Lakers fans. Just one word: VICIOUS. Time to close the series. This just in: Game 6 is happening. Bummer. I don’t understand why Phil didn’t play Artest sooner in the 4th quarter. He was terrific in the first half, and I think him not playing pulled the plug in his rhythm. Basketball is a rhythm game. And Kobe was barely in rhythm the whole game. I thought Kobe was too unselfish in the first half, choosing to play facilitator. He made it up in the 3rd quarter with 14 points but I don’t care what others say, Kobe needs to shoot and he needs to score! As he said in Game 3, he is a scorer first. And that injury —– dang. It was like Bynum all over again – a collective holding of breath in the entire LakerNation. 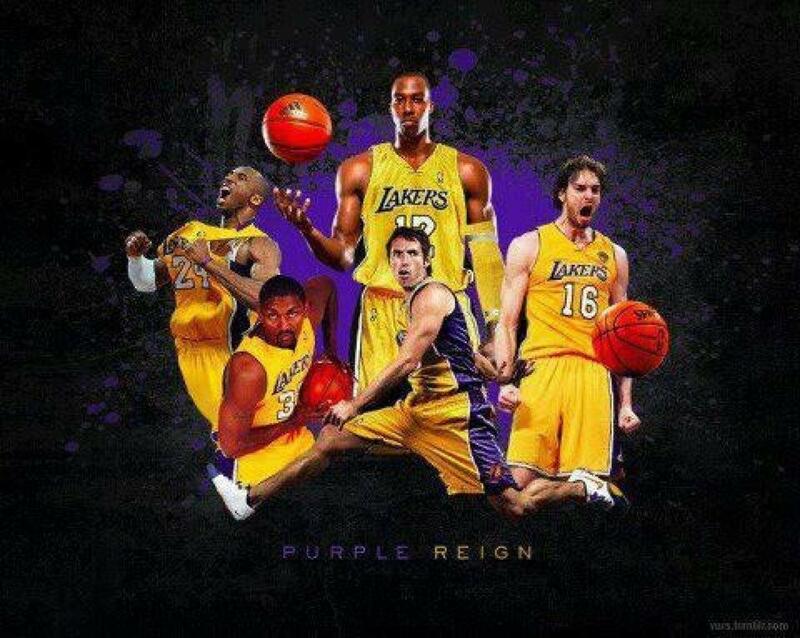 Aside from Odom and Blake, I’m no longer confident in the 2nd unit of the Lakers. I think now in retrospect the only reason the bench is deep is because of Odom, but take him out of the bench, its a very shallow, thin bench. Lakers should go back to their Game 3 winning formula – Go Inside! Bynum, Odom and Gasol killed them in the inside, and in this game, Lakers didn’t capitalize on this HUGE advantage, especially when the Hornets bigs were in foul trouble, with Emeka eventually fouling out. Odom was a non-factor in this game. CP3 had more rebounds than Bynum and Gasol combined?!?! Whatda?! CP3 – Fine. Ikaw na! You’re killing us! Jarett Jack – Who?! Now I know. Ariza – I still would take Artest over Ariza a hundred times. They were going at it in the 1st half. I thought they were both terrific – Ariza just coming on top because in the end, the Hornets won. That’s what matters at the end of the day. BUT….. All this taken into consideration, the Lakers will still win this series. Whether it be in Game 6 or 7 – Playoff experience will make the difference. I think this is just like the Thunder series last year – this is a wake up call for the Lakers. Boston For The Win! Goodluck, Heat. Pacers – too late. But it was still a good win – this playoff experience will pay dividends in the future. Bulls will wrap this up in Game 5. Dallas-Portland – I’m not surprised. Mavs have this tendency to lose leads (2006, anyone?) Now i’m not so sure who will win this series..
Spurs – Grizzlies – Seriously?! I sense Game 7. OKC – Denver – Sweep, anyone? Bynum was a beast! (Gentle, fragile beast). When he went down clutching his knee, I could already sense Lakernation holding its breath collectively. I hope its nothing serious. I agree with the analysis of most commentators – as opposed to previous years when Bynum wasn’t a ‘necessity’ – this year it’s different. He is crucial to OUR championship hopes. It’s not that the Lakers got weaker – it’s more because the competition became harder. Going for a three-peat will not be a walk in the park for the Lakers. But, I really honestly believe by June they will be hoisting that trophy again. Gasol – FINALLY! I had the sense that his struggles were more mental than anything. So this was a game he needed badly to remind himself that he is one of the best in the world! Kobe – what else can I say? That monster dunk was Vintage Kobe, circa semi-afro! Odom – He just keeps on validating his Sixth Man of the Year award. I love it! Magic vs Hawks – I think this will go the distance, with the Magic winning. Though I still have the same sentiments regarding Dwight as I had since last year – he just needs to stop complaining so much and just play his game and not let himself be frustrated! Bulls vs Pacers – Story of the Pacers – almost but not quite. Story of the Bulls – Derrick Rose. ’nuff said. Boston vs Knicks – See?! They are peaking just at the right time. Playoff experience, not to mention, championship experience, is something that is not replaceable. It will be hard for Heat to beat them in the 2nd round. OKC vs Nuggets – that game 1 controversy may have sealed the series for OKC. They will be a formidable opponent for the Spurs in Round 2. I’ll save some more of my thoughts in the coming days. In the meantime, I think Lakers will take the series with Hornets in 5 games. Let’s go Lakers!